Not too many die and live to tell about it but on Anderson Cooper 360’s special: To Heaven and Back, Randi Kaye talks to a few more witnesses who recall the journey to the other side, similar to Mary Neal’s experience. Hi. My name is Anita Moorjani and I died on February 2, 2006. When I was real young, I feel that my life was pretty magical. We lived in a condominium in Hong Kong – I lived with my parents and my brother. I went t a British school where the kids spoke in English and then of course at home with my parents we would speak in our native language, we call it Sindhi, but it’s an Indian dialect. Randi: Walk me through what it was like for you in that childhood with so many different cultures stewing around. Anita: I got bullied very, very badly at school. Because I was pretty much the only Indian child in my year. I wanted to be like them. I wanted to color my hair to make it lighter. I would use bleach on my skin – I really wanted to fit in. At the same time when I met Indian people, when my parents tried to arrange a marriage for me and I was meeting other Sindhi men I didn’t feel like I fit with them either. I kept feeling like I had to apologize for being me. Randi: Let’s talk about your friend Sonny. Anita: Sonny was my best friend. We really knew each others lives inside out. One day she was diagnosed with cancer. I didn’t see her get better and that really impacted me. It’s like just being told you have cancer is a death sentence. So I went on the internet and I started researching her type of cancer and it showed that the statistics were not good. And once you start looking on the internet it’s a mine-field; the more you read about it – the more it was scaring me. I started to become really paranoid. Randi: Did you start to believe that you could get it? Anita: Yes. She was so vibrant and strong, so I felt immediately WOW – if she can get it so can I.
Randi: Tell me about April 6, 2002. Anita: I felt a lump right here on the left side at the base of my neck , just where it meets my collar bone. And when I first went to the doctor – the doctor said it’s a swollen lymph node gland. Maybe you’re fighting off an infection. So she put me on antibiotics and she said, let’s see if it clears up in a week. When it didn’t clear up in a week, she sent me to another doctor – a specialist for a biopsy, and the results were supposed to come back two days later. The very next day, though, the doctor phoned me and he said, “I’d like you to come into my office,” and of course my heart lept. Randi: Tell me what the doctor told you. Randi: So what was going through your mind at that point? Anita: At that point I was only thinking of what I had saw Sonny go through. I watched my friend die and she died a horrible, slow and painful death. And I just thought, ‘Oh my God. That’s what I can expect.‘ That’s whats waiting for me. I started to deteriorate as well, the cancer started to spread, I was like a skeleton with skin – that was it – because I weighed about 80-85 pounds. And I had these big open skin lesions – one here, on my neck and one under my arm. I had tumors, some of them the size of lemons throughout my lymphatic system. And if I lied down I would choke on my own fluid because my lungs were filled with fluid. I was in pretty bad shape. I was in a lot of pain, but I was fighting – I was just fighting to stay alive. Randi: So do you remember one of your worst days – I mean physically – and what that felt like? Anita: Oh towards the end, my worst days, I couldn’t walk anymore. My muscles, like in my legs, had completely deteriorated but one day, it was actually February 1, 2006 and I was just so tired of fighting to stay alive. I remember consciously thinking ‘It’s just not worth it anymore. Even death can be worst than this.’ So I just let go. My husband tells me the following morning I didn’t wake up. He was trying to wake me up and he started to panic, and he called the doctor. Randi: So you were rushed to the hospital – what do you remember? Anita: I was in a coma. My organs had now, shutdown. The oncologist said that I probably wouldn’t make through the next 24-36 hours. I would wake up every morning just obsessed that I had cancer. Every morning I wished that it was a bad dream and that I would wake up from. I was just so tired of fighting to stay alive, so I just LET GO. I actually surrendered to whatever was waiting for me. The doctors were trying to put these needles into my veins and they couldn’t find the veins. The veins had all retracted. And then they were saying this is normal for somebody who is dying. I was in a coma and I didn’t realize I could hear them. They weren’t even in the same room but I heard the oncologist say that I probably wouldn’t make it through the next 24-36 hours. Randi: In a way it sounds like, you were almost straddling two worlds? Anita: It felt like I was in a bigger world which encompasses this world. It was vibrant, there was music – it was just incredible but it’s like it’s beyond our spectrum, our ability to perceive, beyond 5-senses and it was like for the first time in my entire life did I feel that I was loved and accepted unconditionally for who I am. It was a peace I had never experienced and the fear was gone. The fear of illness, displeasing other people, the fear of being flawed – it’s gone. I was aware of my father who had passed away, my best friend Sonny. It was actually, the most amazing feeling because I had always felt that I wasn’t the kind of daughter that he had hoped I would be but when I encountered him in that realm all I felt from him and for him was pure unconditional love. Randi: But you could still see your husband and how was he reacting to the fact that you were in this coma and he thought he was loosing you? Anita: He was very distraught. He was there by my bedside, he was holding my hand and I could feel he was willing me to come back. Randi: And you had a choice to make. Anita: I had a choice as to whether to come back or not. At first I absolutely did not want to come back because why would I want to come back into this sick and dying body? But then it was though in the next moment I understood why I had the cancer. All the years of beating myself up, feeling flawed, had turned my own energy against me and manifested as cancer. Randi: Fear in a way poisoned your body? Anita: Yes it did. And I understood that now that I knew this, my body would heal. Randi: You had this huge revelation and Sonny and your father both affirmed what needed to be done. Anita: Both of them said to me, ‘Go back and live your life fearlessly,’ and it was around that time that I started to come back. Randi: So how long were you in the coma? Anita: About 30 hours. I was in the intensive care unit, but within 4 days they were able to take off the oxygen, they were able to take out the food tube and the tumors shrunk by 70% . Randi: And the doctors kept testing you right? They kept looking for cancer, they kept treating you? Anita: They were saying there is no way that cancer disappears like that. My oncologist actually said to me, I had no idea what to even write on your medical records anymore. Randi: [holding documents] These are the results of an MRI scan from your neck and thorax, and if you’ll look on there – tell me what’s on there? Anita: [looking @ document] Throughout my body, it’s showing large masses from my neck, lower lungs, all over. Randi: So that report is from February 2, 2006. This one is 25 days later, read to me what the doctors finding was. Anita: The doctors finding is that in summary, no definite evidence of residual lymphoma is seen. Randi: How did the doctors explain it? Anita: I have had at least 5 oncologist look at my records and all of them have said, they’ve never seen anything like it. Randi: Are you still, at all fearful. Anita: No. Hardly at all. I don’t live in that constant feeling of fear at all. I’m not scared of death. Whenever that day comes, I feel that I would have accomplished whatever it is that I came here to do. Anita: You know I believe that all of us have only come here to realize who we are and to be true to who we are. Randi: Most people, myself included, fear death. What do you say to them? 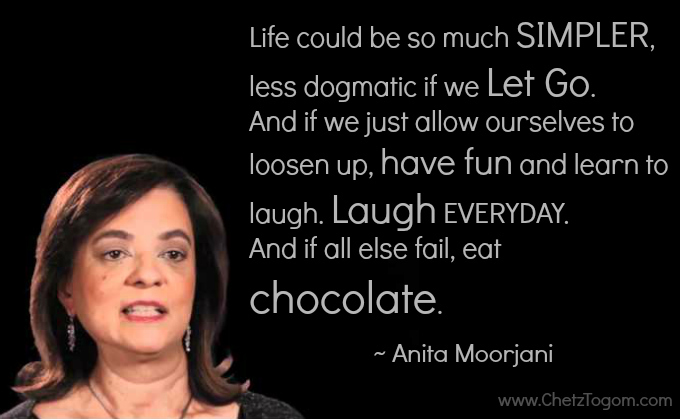 Anita: When you lose your fear of death, you actually lose your fear of life as well. Randi: And to this day you are cancer free? Anita: Yes. I am cancer free. LIVE YOUR LIFE FEARLESSLY – stay positively healthy in your mind. For what the mind accepts, into the body we find in kind. to only boomerang you for all that its worth. Be it good or bad – it is coming back to you. Henceforth, be about those positive truths. You determine a great deal of you. You definitely get out of – what you’ve put into. Encouraging thee to smile and get out there and win!